For years, architectural historians in the west appeared to believe that hardly any avant-garde architecture ever got built in the early Soviet Union. Concentrating their interests on unbuilt projects and a handful of Moscow buildings by famous names like Konstantin Melnikov and Moisei Ginzburg, they missed out on the fact that entire cities were transformed by Constructivist designers at the end of the 1920s — Kharkiv, Zaporizhia, Novosibirsk, to name a few. Perhaps no city was more transformed than Yekaterinburg, then known as Sverdlovsk after the Bolshevik leader Yakov Sverdlov. Today it has as many Constructivist buildings as Moscow or St Petersburg, but here, it was all built at once, in a much smaller area, so it still defines and dominates the city. Every one of the sometimes strange typologies of the early Soviet state are there. Workers Clubs, dormitories, Palaces of Culture, communal housing, workers housing, factories and water towers: all were designed according to the most radical ideas in Europe at the time, with a machine aesthetic being achieved sometimes with very pre-modern means. This walking tour covers the most prominent buildings, mostly in two groups – in the city centre, transformed through the “Big Sverdlovsk” Plan at the end of the 1920s, and in the new industrial town of Uralmash on the city’s northern edge. Nearly all of the buildings were begun during the first Five Year Plan of 1928-32, when the Soviet Union first industrialised, at rapid speed and extreme human cost. Unlike in many other cities, most of the buildings escaped being caked in stone and ornament when Stalin and his associates banned Constructivism during the construction programme of the second Plan, so the city has an almost unrivalled legacy from the revolutionary era, something that many local activists and enthusiasts in Yekaterinburg have tried to make their own. Many of the best Constructivist sights in central Yekaterinburg can be seen by walking down the main thoroughfare, Prospekt Lenina. You should start at the intersection with Ulitsa Luncharskogo, where the curved façade of the Hotel Iset leads onto the housing complex known as “Gorodok Chekistov”, or Chekists’ Village (Prospekta Lenina 69; architects I. P. Antonov, Veniamin Sokolov and Arseny Tumbasov, 1929-36). The largest, most “iconic” and most sinister of the city’s avant-garde complexes, this was a new district entirely for members of the secret police (NKVD) and their families, and is much larger than the Builders’ Village over the road — a city within a city, which was originally gated; the fences were removed under Khrushchev, but the gateposts are still visible. It comes in two distinct parts – rows of multi-storey flats with bay windows, in a sort of cubistic version of Brooklyn or Glasgow, and a street frontage made up of a club and a ten-storey tower, which on plan are claimed to resemble a connected hammer and sickle. 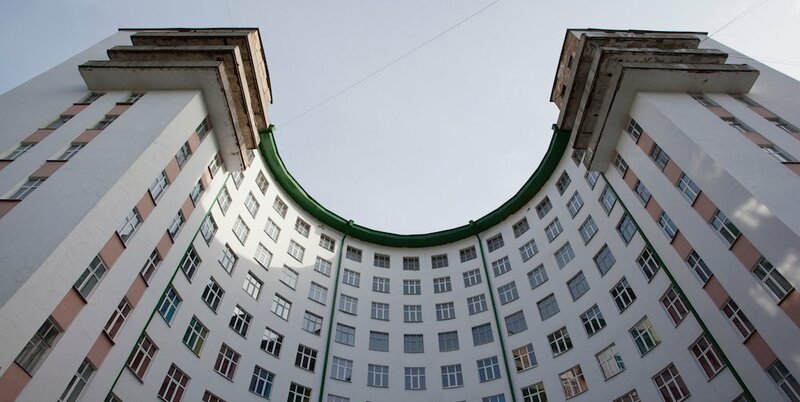 The huge, circular ten-storey “sickle” was originally a communal house for single Chekists, before being turned into the Hotel Iset after 1956; it was recently used as the headquarters of the Ural Industrial Biennial. The Dzerzhinsky Club, the “hammer”, is now the Natural History Museum, but staff will let you in to see the astonishing curved “red star” staircase The curved ground floor of the Hotel Iset has a Soviet-nostalgic “Factory Kitchen” restaurant. Opposite the Iset at number 50 is the Workers’ Club for the Builders’ Union (Iakov Kornfeld, 1929-1933). One of the purest modernist buildings in Yekaterinburg, part of the “Builders’ Village”, an integral community for the construction workers who built the new city, complete with schools, leisure centres and parks, an early version of the “microdistrict” concept popular in the Soviet Union after Stalin. 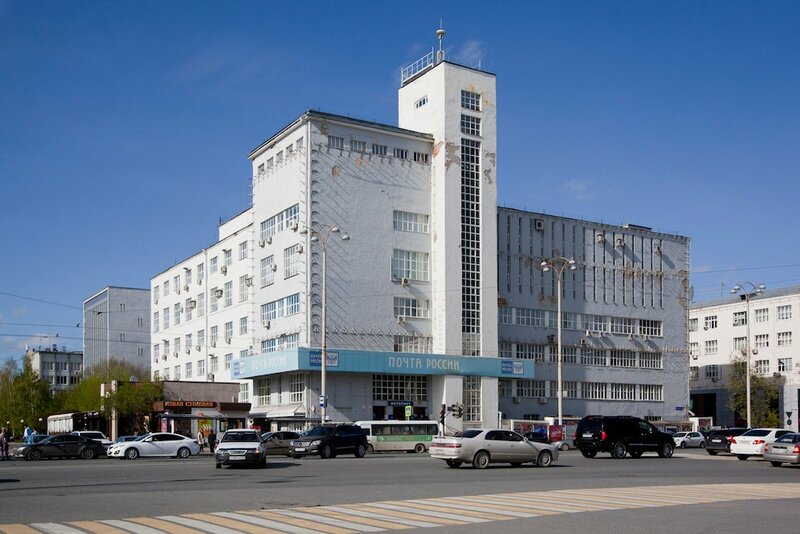 The designer was a Moscow architect, from the Constructivist OSA group, and that training can be seen in the total lack of any historical residues of this gleaming white, highly abstract assemblage of cubes and purist planes. For some years it has been a film studio. Walk west down the Prospect, past a statue of Sverdlov himself striking a strident pose, and on your right at number 49 you can see the House of the Press (Georgy Golubev, 1929-1930). A headquarters for the Party press and the Ural Worker newspaper, this is in the curved, ribbon-windowed style pioneered for department stores and printworks by Erich Mendelsohn in Weimar Berlin (he also designed a factory in St Petersburg): long, horizontal and smooth, whipping dramatically around the street corner. Georgy Golubev was one of an active group of local modernist architects in the city, and later became its City Architect. Further along at number 39 is the House of Communications (Konstantin Solomonov and Veniamin Sokolov, 1929-34) that served as the Post Office, Central Telegraph office and general communications centre for “Big Sverdlovsk” and the rapidly industrialising Urals; its staggered, angular composition and strongly vertical strips of windows make it similar to Telephone Exchanges of the same period in Kharkiv and Moscow. Across the road at number 34, behind the Chapel of St Catherine, is the Ural State Executive Committee of the Communist Party, or Oblispolkom (Sergey Zakharov, 1929-33). Located right in the centre of the city, this office block is broken up into several distinct parts, some with ribbon windows, some with assymmetrical balconies, others in a more conventional blocky style, connected by three enclosed overhead walkways, an example of the Constructivists’ three-dimensional, slightly sci-fi approach to spatial planning. At this point you are at the southern base of the City Pond, the lake at the heart of Yekaterinburg around which numerous other Constructivist curiosities are clustered. Walk past the water and turn right onto Prospekt 8 Marta; you can also walk up the waterfront if you prefer the view. At number 1 is the House of Old Bolsheviks (Ivan Antonov and Leo Weiss, 1933). 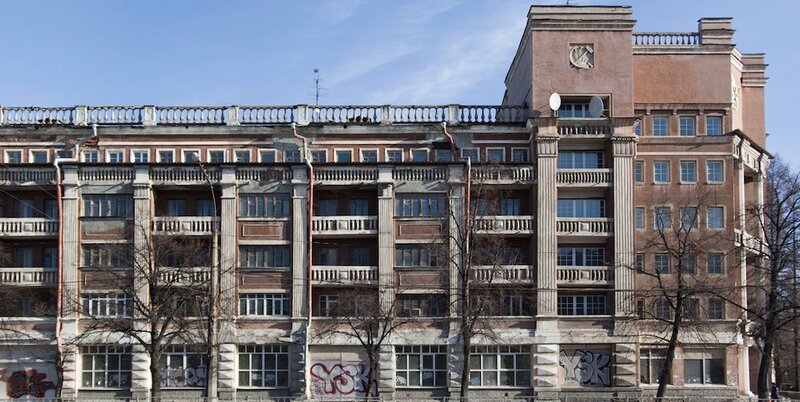 The society of Old Bolsheviks was founded in 1922 for veterans of the revolutionary struggle, and often built communal housing complexes for its members — one stands on the Neva in the centre of St Petersburg. This example is a block of strongly right-angled, geometric flats, with a communal garden. 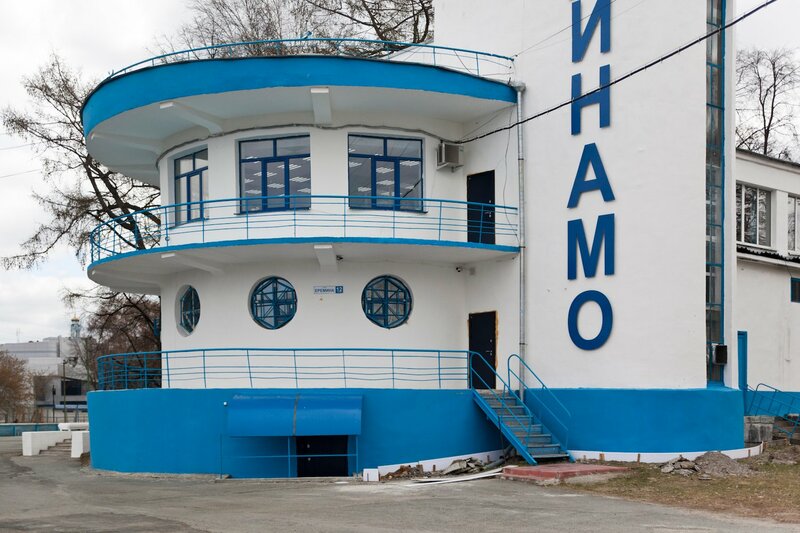 Across the Pond you can see the low, white and blue structure of the Dinamo Sports Complex (Veniamin Sokolov, 1929-34), which is well worth a stroll around the waterfront to admire up close. The most enjoyable modernist buildings in Yekaterinburg, these consist of a couple of sports clubs and a stadium, all in icing-sugar white rendered concrete, and with lots of the sort of things harder-line Constructivists would reject for being too decorative — prow-like corners, ship metaphors, art deco curves. It occupies most of a peninsula jutting into the city lake, and is a very well used public space in good weather. Enthusiasts for the building are at the heart of attempts to stop the construction of a retro-Tsarist church on an artificial island next to it. Back on the other side of the Pond, you can catch the city metro north to the industrial district of Uralmash. From the Ploshchad 1905 station on Ulitsa 8 Marta, stop, take the green line north four stops to Uralmash. From here, walk west down Ulitsa Mashinostroiteley to number 19A: the Uralmash Administration Building (Petr Oransky, 1933-35). 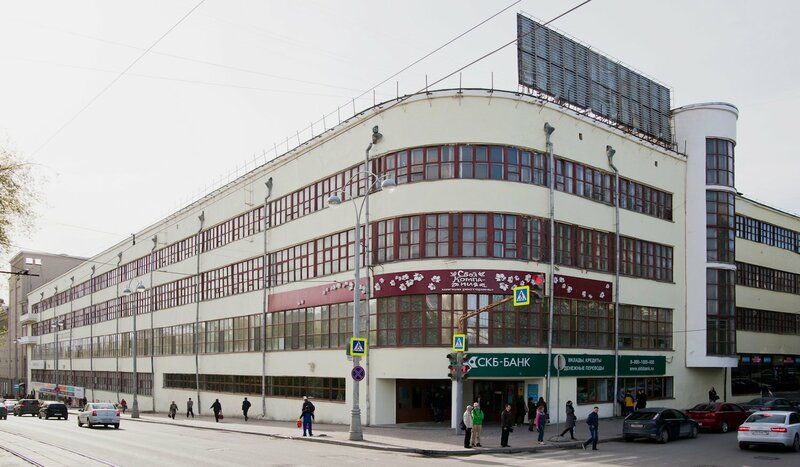 At the entrance to the factory, this is a very stern, hard-lined modernist building in grey concrete and with plate-glass ribbon windows, asymmetrical and angular, framing a statue of the Commissar of Industry, Sergo Ordzhonikidze; behind the factory gates is a more moderne office block of the same period with a curved glass stairwell in the middle, and a fabulous Brezhnev-era multicoloured mosaic, which security guards will not let you photograph. On the other side of the square is the beginning of the pedestrianised Ulitsa Kultury, whose first building is the Hotel Madrid (1928-34). This was originally a modernist design, by Bela Sheffler, one of the many German architects to flee to the USSR during the rise of Nazism; a vigorously expressed corner facing a green square and Uralmash’s war memorial. An urban myth has it that it was intended to be a hotel for Spanish refugees during the Civil War (hence the name) but for most of its history it was a women’s dormitory, and it is now almost entirely disused. 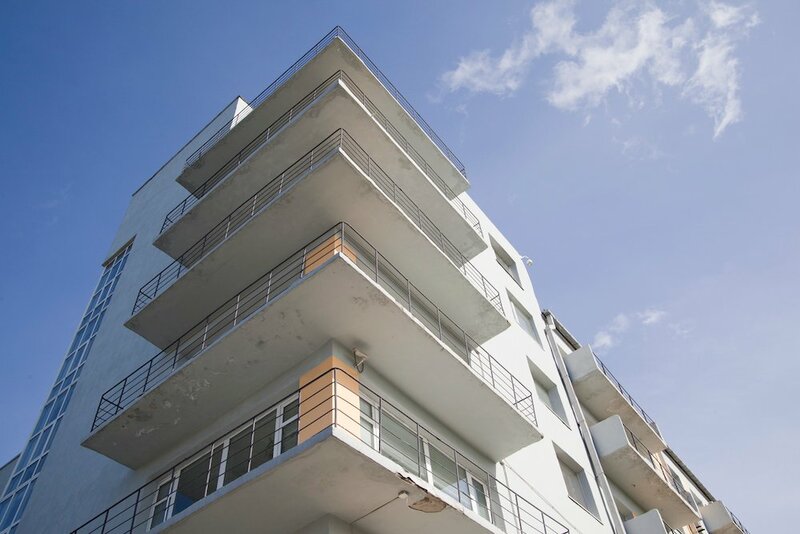 The building was classicised in the second half of the 30s, with tacked-on balustrades and decorative columns, placing it somewhere between the geometric severity of modernism and the authoritarian classicism that followed it. 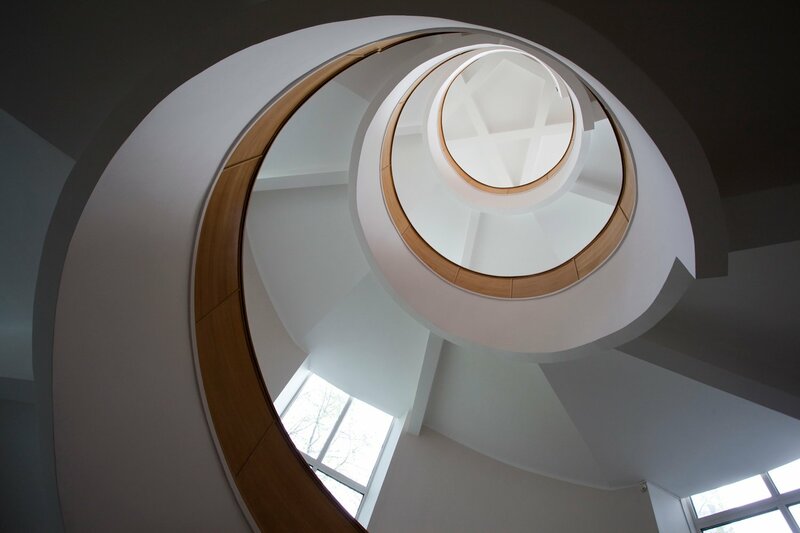 Its original architect, a Bauhaus graduate and KPD member, was executed in 1942, a victim of Stalin’s xenophobic purges; a grim end to what was once an internationalist story. Two buildings down at number 3 is the microdistrict’s Palace of Culture (Valery Paramonov, Moisei Reischer and Bela Scheffler, 1929-33). Left half derelict after a 2008 fire, this is a multi-functional cultural centre for the new town, built closely into its residential streets, with two partly glazed stairwells and a columned entrance, its symmetry showing an early move towards classicism and monumentality. In order to finish your tour at one of Russian’s most astonishing avant-garde buildings, continue walking up Ulitsa Kultury, which doglegs at number 21, until you get to the highway on Ulitsa Donbasskaya. On your right will be the so-called White Tower, which was in fact once the Uralmash water tower (Moisei Reisher, 1928-29). By a member of the local group of Constructivist architects, this striking tower served the new town built around the Urals Machine-Building Plant, and is one of the most abstract buildings in the city — without knowing what it was, you’d assume some sort of Futurist control tower, with its cylindrical lookout above spindly concrete stilts. It is being slowly restored by a group of local preservationist activists, and occasionally shows films and exhibitions in the warmer months.